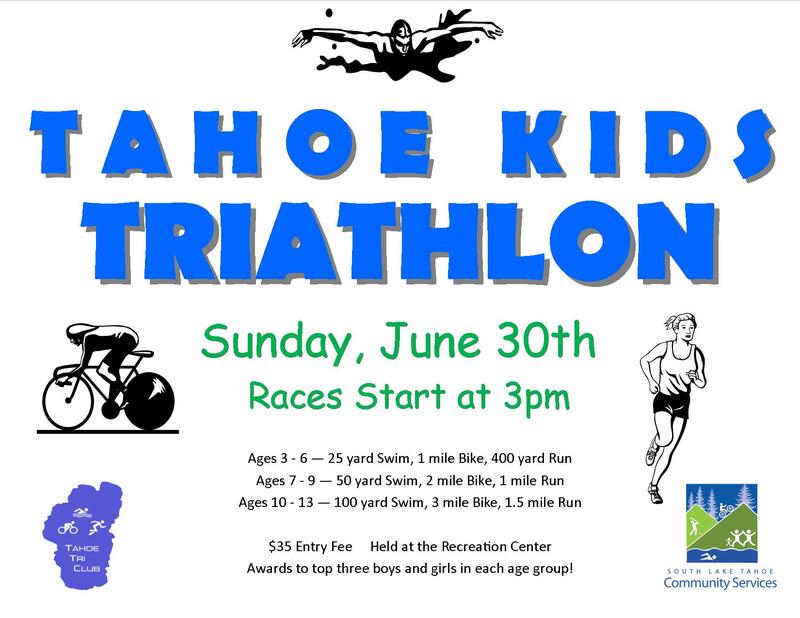 South Lake Tahoe, CA…The City of South Lake Tahoe Recreation Department is proud to partner with the Tahoe Tri Club and is hosting a Kids Triathlon this Sunday, June 30th at the South Lake Tahoe Recreation Complex at 3pm. Registration for the event is $35. The Tahoe Kids Triathlon is a super fun and super spectator friendly triathlon (series) for kids ages 3-13. The triathlon course includes the Recreation Complex Swimming Pool, Parking Lot, and Greenway that surrounds the Campground. A post-race party, BBQ and yearly age-group awards will follow the triathlon. Arrive at the South Lake Tahoe Recreation Complex by 2pm to pick up race packets and have time to set up your transition area and races will begin at 3pm. The Recreation Complex is located at 1180 Rufus Allen Blvd. Join the Tahoe Tri Club and get a free shirt and the opportunity to train all summer with the club. It’s only $31 and you can sign up through Active. For more information, visit www.tahoetriclub.com or contact Jason Collin at 530.307.3316. One Response to "Tahoe Kids Triathlon This Sunday"